Cook spaghetti according package directions. Toss spaghetti with Parmesan cheese while spaghetti is still hot. Meanwhile, in a frying pan or dutch oven cook sausage until lightly browned on both sides. Add basil, garlic, and tomatoes to sausage and simmer for 3-4 minutes. Add sausage mixture to spaghetti and serve. 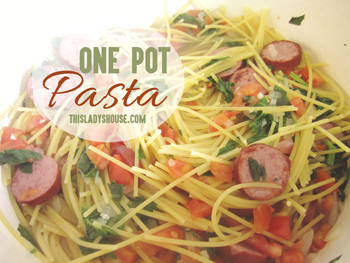 This entry was posted in Recipe and tagged Dinner, Pasta, Pork.